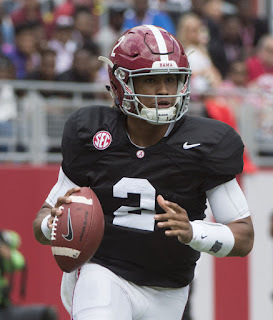 After a big opener that displayed to the college football world they were still the team to beat, Alabama pounded Western Kentucky, as expected. After a strong but up-and-down debut, true freshman QB Jalen Hurts looked legit, throwing for 287 yards and two touchdowns. He looked in sync with top wideouts Calvin Ridley and ArDarius Stewart, and the Tide feasted on a weak Hilltoppers' pass defense. This game didn't build Alabama's resume much, but it does give the Tide momentum for a pivotal Week Three battle with Ole Miss, who has of course topped them the past two seasons. Much like Alabama, Florida State was coming off a huge victory in their opener over Ole Miss and looked to continue to build their momentum. They faced a Charleston Southern squad in the midst of a scandal, and didn't face a whole lot of competition. Redshirt freshman quarterback Deondre Francois has lived up to the hype so far, tossing for three scores in this one. Mixed with Dalvin Cook (who had 83 yards and two touchdowns on just 11 carries) and a powerful, deep defense the Seminoles look every bit as much of a National Title contender as Alabama. Also like the Tide, FSU gets a huge game in the third week, getting tenth-ranked Louisville, who has looked unstoppable behind the play of Lamar Jackson. A win could further cement FSU as the team to beat in the ACC. Clemson got a quality win in their opener against Auburn, but it wasn't the dominating victory some may have expected from the National Runner-ups in 2015. Clemson had to survive a late rally from the other Tigers, but hung on. Their second meeting was much the same, albeit against a weaker team. The Tigers showed plenty of offensive prowess but an uneven rushing attack and two interceptions by Heisman candidate Deshaun Watson kept Sun Belt foe Troy in the game. Clemson hung on to avoid any upset, but it still wasn't the wonderful win many were hoping would prove the Tigers are once more elite. Their play may drop them a few spots right now, but considering it is still very early on in the season and the team is still hitting their stride, it shouldn't be too worrying. Much like a wide variety of other teams in the Top 10, Michigan got a relatively soft second week game, and had no issues. They faced off against the UCF Knights, who are improved from last season, but have still won just one game over the past two seasons. The defense has been terrific early, but that was to be expected. What is surprising is the play of new quarterback Wilton Speight, who many just assumed would back up former Houston transfer John O'Korn. Speight tossed four touchdowns in this victory, and has looked poised and in control in the first two games. Next up for the Wolverines, a meeting with Colorado, who has looked good early against poor competition. It will be the toughest test of the year for Michigan so far, and will give us further indication on whether this is truly a legit Playoff contender. After enjoying an offensive explosion in their opener against Bowling Green, Ohio State did things a little different in Week 2. The defense stepped up in a huge way, holding a mediocre Tulsa offense to just a field goal, while forcing plenty of turnovers and sacks with the speed they possess on that side of the ball. Also different was the ground game, which didn't do a whole lot in the opener, as J.T. Barrett was doing everything. Young but talented Mike Weber looks like the clear feature back, while the explosive Curtis Samuel also feasted. After getting perhaps their biggest victory in school history on the first weekend, would Houston suffer a letdown in Week 2? Even without star quarterback Greg Ward Jr. (who was injured), the Cougars rolled past FCS foe Lamar. Not known as a rushing offense, Houston found most of their success rushing the football. Kevrin Justice had 111 yards, Mulbah Carr had 109 and Kyle Postma, who took over for Ward, ran for 106 yards and two scores. Much like many other week two games, this one really didn't give us a whole lot of info on the Cougars, but it did show their vast array of offensive versatility. The Cardinal were on a bye this week, so obviously we didn't learn anything about the team that looked good, not great over Kansas State in the opener. The Cardinal are hoping that bye will help them be prepared for an important game against USC this Saturday . The Trojans are eager to prove to the rest of the nation that the blowout loss to 'Bama was merely a fluke, and this game could be a Pac-12 Championship Game preview. Over the summer, perhaps no team in college football was receiving the hype Washington was. After a 7-6 mark in 2015, the Huskies were a popular pick to breakout in 2016 behind a young but talented offense. So far, they've matched those expectations, with wins over Rutgers and Idaho, both blowout wins. Neither of those wins are going to prove UW is a real National Title contender, but it does show what they can do. Quarterback Jake Browning has looked terrific and on the other side of the ball, the Huskies' shutdown secondary has been stout.